Last night, during the epic Big Brother 18 finale, Julie Chen revealed the first twist of Big Brother: Over the Top. 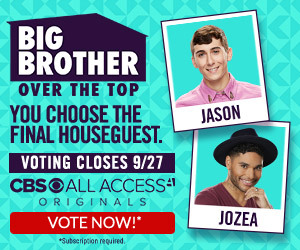 In addition we learned that the new batch of 12 houseguest (13 with either Jason or Jozea entering) Monday, September 26th! Also, as we already reported, for the first time ever fans will get to watch EVERYTHING play out completely live! That means all access (no blackouts) to every HOH and POV competition, no fish to every nomination and pov ceremony, it's unfiltered access like NEVER before. We will also have the opportunity to vote and impact the game like never before, but the details on that are to come. In addition - in a Big Brother first - fans will be able to watch Live Diary Room Sessions! We will get an all access inside look into the confessionals live on Tuesdays and Fridays at 10:30 PM, ET/7:30 PM, PT. What could be better than that? Oh yeah, we also get to crown the winner! That's right, fans will vote for the winner of Big Brother: Over The Top. Now, it's unknown at this time if that means we get a vote on the jury, or if there will even be a jury, and will they still vote to evict one houseguest every week? All those questions are still unanswered, but we know for sure we get to help crown the winner in some way! 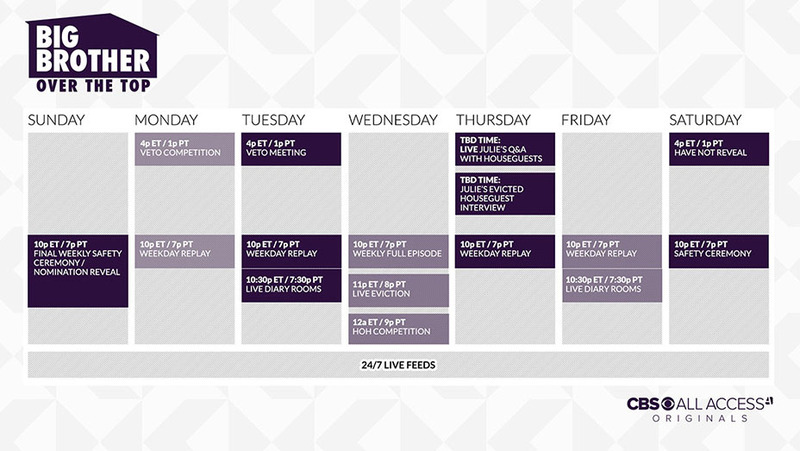 Weekday Replay – A quick recap of all the crucial moments that happened throughout the day. Available on Mondays, Tuesdays, Thursdays and Fridays at 10:00 PM, ET/7:00 PM, PT. Safety Ceremonies – Live on Saturdays and Sundays at 10:00 PM, ET/7:00 PM, PT, the HOH will reveal the houseguests who are safe for that week, culminating in the live reveal of the nominations on Sunday evenings. Live Diary Room Sessions – In a BIG BROTHER first, fans will get a live look into the confessionals on Tuesdays and Fridays at 10:30 PM, ET/7:30 PM, PT. Evicted Houseguest Q&A with Host Julie Chen – Every Thursday afternoon, host Julie Chen will interview that week’s evicted houseguest (times will vary). Big Brother Winner Chosen By Fans – Fans will vote for the winner of BIG BROTHER: OVER THE TOP. America’s Vote – Fans will have the opportunity to impact the game like never before and affect nominations, evictions and game-changing twists. More details will be revealed during the premiere of BIG BROTHER: OVER THE TOP on CBS All Access. Plus, Julie Chen teased some more details about Big Brother: Over The Top to Jeff Schroeder last night during the Big Brother 18 backyard interviews. What is this "Safety Ceremony"? Guess we will have to tune-in to the BBOTT premiere on Wednesday, September 28th at 10pm EST/7pm PST. Through CBS All Access, Big Brother: Over The Top will be available to stream online at CBS.com, on mobile devices and tablets via the CBS App for iOS, Android and Windows 10, and on Roku Players, Apple TV, Xbox One, Chromecast, Android TV, Amazon Fire TV and Fire TV Stick, with more connected device platforms coming soon! In addition to Over The Top, CBS All Access offers more than 8,500 on-demand episodes from the current season and previous seasons as well as classic CBS shows, plus the ability to stream local CBS stations live in more than 150 markets across the U.S.
CBS All Access offers two types of subscriptions: limited commercials for $5.99/month and commercial-free for $9.99/month. CLICK HERE to sign-up. If you're not watching Big Brother: Over The Top, don't worry because Big Brother has already been renewed for its 19th and milestone 20th seasons for broadcast in summer 2017 and 2018. 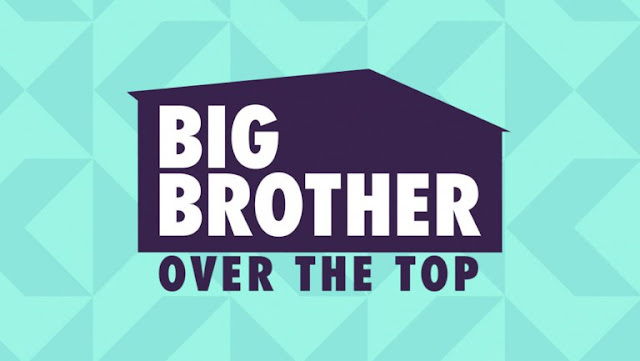 Find us on Facebook & Twitter for all things Big Brother: Over The Top!